This weekend was full of activity and rest. We enjoyed happy hour, a play, a bike ride, wedding stuff, a visit from a new friend, a track workout, a visit to my niece’s college campus, a swim, and grocery shopping. We also wrote thank you notes and put lots of stuff from the move away around the house. And I practiced the guitar and wrote in my journal. Now Dave is out cooking on the grill while I write. The holiday weekend had its highs and lows, but mostly it was wonderful. 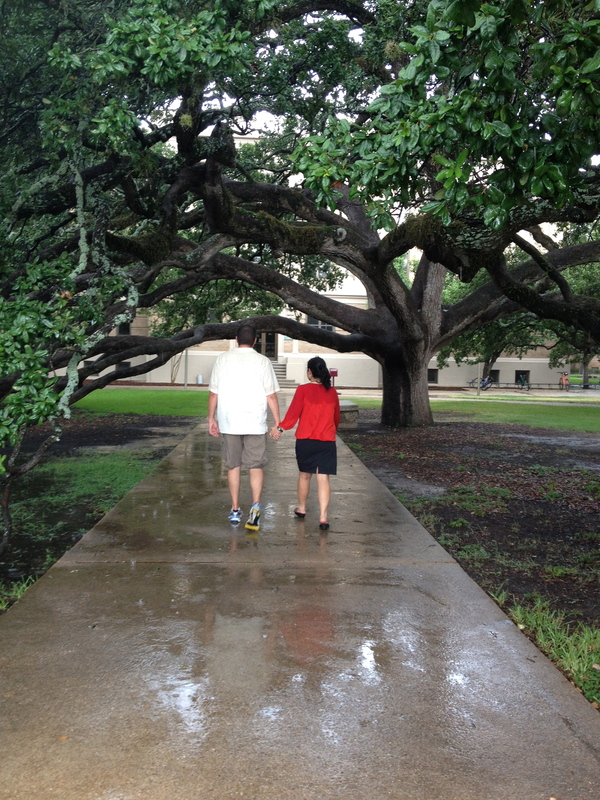 Perhaps my favorite part of the weekend was the moment we got caught in the rain as we toured my niece’s college campus. We were about to call it a day when my niece suggested we walk over to the Century Tree, a grand oak on campus that apparently is a popular place for wedding proposals. On our way there, the rain came down, but we didn’t back down. We started running in the rain and found shelter briefly on the patio of a building near the tree. 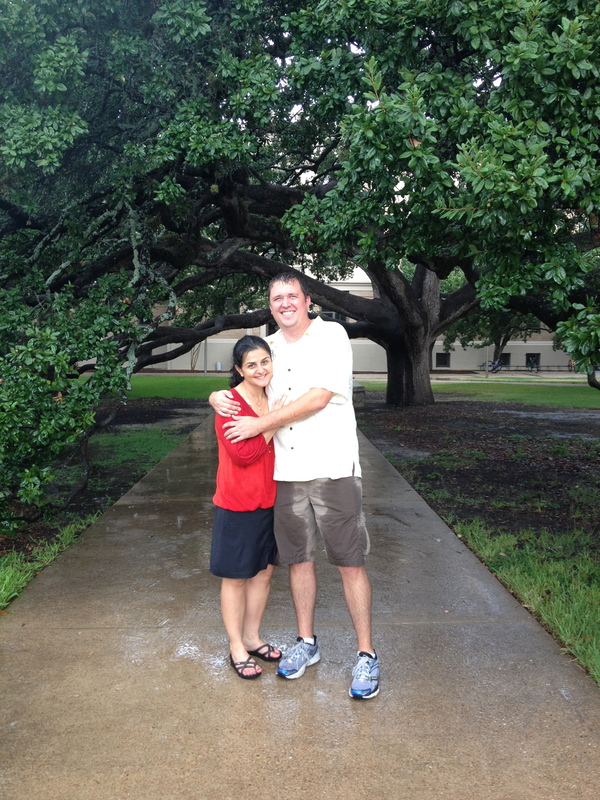 Once the rain lessened, we went to the massive tree and walked under its magnificent branches. As I understand it, tradition is that if a couple walks under the tree, they will marry. And lots of people propose under the tree because those marriages are supposed to last forever. My niece decided Dave and I needed to walk under the tree so we made our way there, despite the rain, laughing much of the way. I won’t soon forget my niece’s spirit or smile as she led the way and did her best to take pictures without actually walking under the tree, since part of the superstition is that walking alone means you’ll be alone forever. I won’t soon forget how my sister, the only one of us unfortunate enough to be wearing jeans, didn’t seem to mind the rain on this particular journey. She laughed too and forged ahead with us even though she faced a two-hour car ride home in clothes that wouldn’t easily dry. And I especially won’t forget how young and hopeful I felt walking – and at times running – through that campus with a sweet boy who makes me feel safe and held. I don’t know if the Century Tree tradition applies to people who aren’t students. I don’t really care. It was a lovely moment that I won’t soon forget. This entry was posted in Hope, Love. Bookmark the permalink. ← An Evening in Coupeville. That second photo is so special.